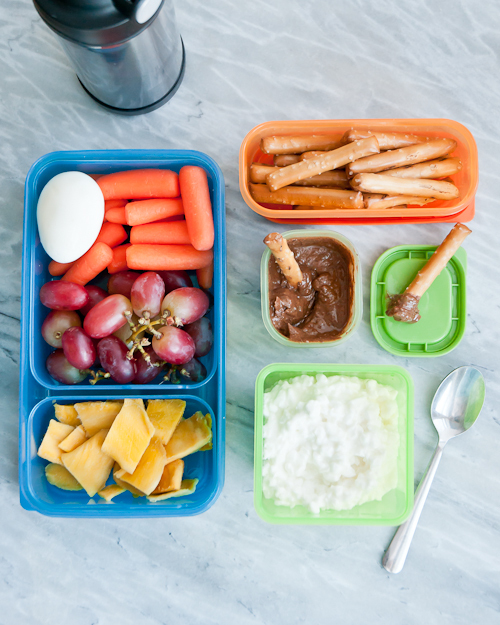 Menu #19 in our Lunch Box Series is another favorite snack-y lunch. There are lots of little finger foods that are perfect for sharing with a friend, but tasty enough I know they’ll eat them. – I’ve started substituting Nutella with a healthier version from Nuttzo. If your kids attend a nut-free or peanut-free school, substitute with cookie butter, sunflower butter, or hummus. – I wrote a tutorial all about cooking the perfect hardboiled egg. – This lunch requires an ice pack. Dried mango is great! Not messy and easy to share. I have to share that I went out and bought the EZ squeezees you featured recently – LOVE! We used them on holiday car trip last week and my 3 year old and 14 month old were in heaven! Thank you!